Engineering Aides in the Navy assist construction engineers in developing final construction plans. They're part of the Construction Battalion, or Seabees, and used to be known as Carpenter's Mates or Surveyors. In fact, the insignia for an engineering aide's uniform still shows a Philadelphia rod, or level staff, which is a tool used by surveyors. This job involves conducting land surveys and preparing maps, sketches, drawings, and blueprints. The Navy categorizes this rating (or job) as Navy occupational rating (NOS) H140. In addition to conducting surveys, these sailors prepare hydrographic, topographic and triangulation drawings and maps and prepare architectural drawings and sketches. Their day-to-day activities may involve computing the volume of bulk materials like concrete from drawings and specifications, or operating and maintaining various types of precision surveying and laboratory test instruments and equipment. In addition, Navy engineering aides design grading and drainage systems, conduct tests on soil and asphalt and oversee and conduct quality control inspections for Navy construction projects. EAs may work in a variety of conditions, independently or as members of a large team. Their many different duties may be performed in climates ranging from tropical to arctic. To be eligible for this job, you'll need a combined score of 210 on the arithmetic (AR) and mathematical knowledge (MK) segments of the Armed Services Vocational Aptitude Battery (ASVAB) tests. 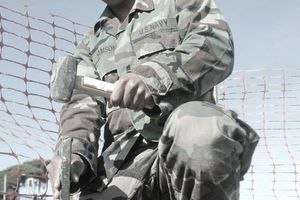 There's no Department of Defense security clearance requirement for Navy engineering aides, but the job does carry a 60-month enlistment obligation. You'll also need a passing grade on either an advanced high school or college-level course in trigonometry. Sailors in this job also need vision correctable to 20/20. After basic training at Recruit Training Command in Great Lakes Illinois, sailors in this job spend 107 calendar days in A-school (what the Navy calls its technical school) at Fort Leonard Wood in Missouri. Although much of the work these sailors do is specific to the Navy, the training they receive and the work experience they gather will qualify them for a variety of civilian jobs. They'll likely be able to find work as surveyors, carpenters, or for a number of other construction site jobs. This job also paves the way for a career as an architect, although there's a fair amount of extra training and advanced education required to become a full-fledged architect.